Life in the fast lane isn't always easy but Impact's Web Services are helping UK Airports deliver first class service before their passengers have even taken off. Several UK aiports including London Luton offer priority lane systems, for passengers wishing to skip the queues at security. With a host of affiliates clambering to re-sell priority security passes to passengers before they arrive at the airport the issue for the airports is how to deliver a seamless service. 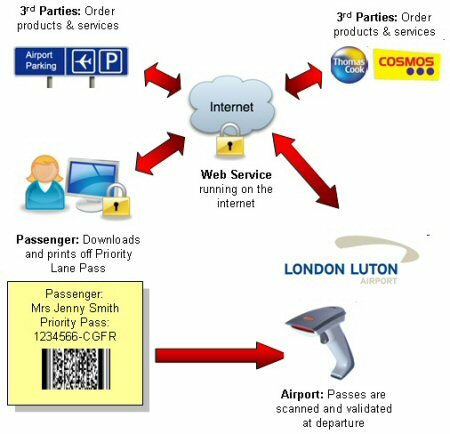 The software development solution was for Impact, in conjunction with UK touch screen manufacturer Touch4, to develop web services that allow 3rd parties to advance order the passes, and then provide an email or link to the passenger to print off their own 2D-Barcode pass. This can then be scanned at the airport via a touchscreen kiosk to allow security staff to monitor and check off the passes at departure.